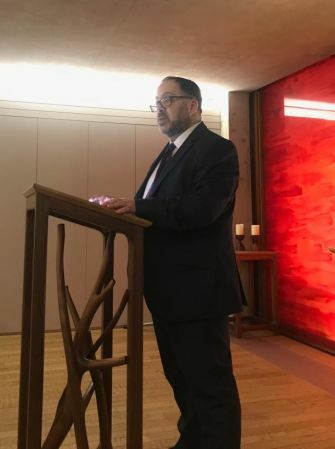 This is the text of Rabbi David Mason’s address at the LSE Faith Centre’s 2019 Holocaust Memorial Day service. 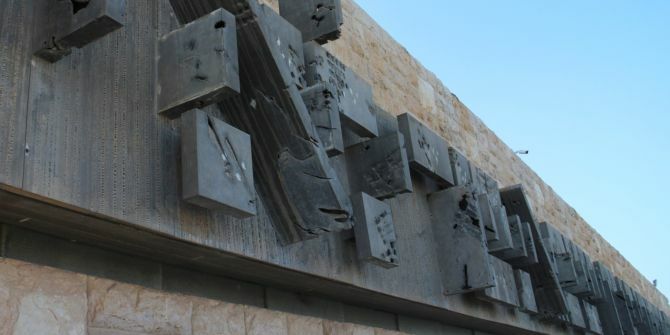 Picture taken on the LSE Interfaith Trip to Yad Vashem. Photo: LSE Faith Centre. I often visit Poland. It is actually where my in-laws live – my wife is from Lodz, Poland. And I have often taken groups there from the Synagogues I have led. Poland is a country with a small number of non-Poles, of minorities, and its government presently, as we know, has a very nationalist view of politics. But before the Second World War, there were over three-and-a-half-million Jewish people in Poland. There are now maybe 10,000, although probably less than that. A large number were slaughtered in the Holocaust. Of those that stayed, most fled Soviet purges in 1956 and 1968. And so what remains in Poland is a shadow, an echo, of what was. You can visit souvenir shops and buy wood cut models of Chassidic ultra-Orthodox Jews – but that belies the rich diversity of the Jewish community in pre-war Poland. Just visit the Warsaw Jewish cemetery one day and you will find there Rabbis, Bundists, Zionists and more. What remains are gaps. Gaps where people lived, where people prayed, where people shopped, where people gathered. What remains are traces of memory. In fact, if you criss cross Poland, you can find these traces of memory. Remnants of a Synagogue, a ritual bath, a cemetery. In the Yiddish language that was spoken by so many in Poland and other parts of Europe before the War, Poland was pronounced ‘Polanya’. And with a providential linguistic turn, Polanya can be broken down into 3 Hebrew words: Po Lan Ya – here dwells God. The town of Oswiecim, renamed Auschwitz by the conquering Reich, was often nicknamed Oshpitzin, which means ‘guest’ and refers to the symbolic Biblical guests we invite into our Succah booth on Succot, Tabernacles. Poland was a Jewish home, and the Final Solution tore it asunder from under the Jewish communities that were there living. Last Sunday was the 77th anniversary of the conference held at the Wannsee Palace on the edge of Berlin. Mass killings had already began by that time, but at the conference that ‘Final solution of the Jewish question’ was worked on, and as stated then, over 11 million Jewish people would come under German control. It is chilling to think that this would even include the half million Jews living in the UK. How low had Europe stooped, that in its cultured, intellectual, modernist midst could rise up such evil as the Nazi terror. We must remember that this was not just populism; this was an ideology of fascism that would use the guise of democracy and the aftermath of the First World War and subsequent Great Depression, to take control in Germany. And it is so painful and yet so beyond our perception, to understand what exactly those delegates at Wannsee were plotting behind their euphemisms. Rabbi David Mason speaks at LSE’s Holocaust Memorial Day service. Photo: LSE Faith Centre. I remember the first time that I visited Auschwitz death camp in Poland. I was working as an educator for the Lauder Foundation in Poland and I took the opportunity to go. For many Jewish people it is, in a bizarre sense, a place of pilgrimage. When I take tours to Poland, at the pre-orientation meetings that I run, I always ask people what they most anticipate. Few people say they are looking forward to historical journeys (in spite of there being a 1,000-year history for Jews in Poland) or to seeing what community exists today – and there are still serious number of Jewish people who want to be noticed. Most refer to their need to visit Auschwitz. And so I went. Alone. And I remember walking back down the platform of Birkenau, where so many thousands of humans were unloaded from cattle trucks, and feeling that I had hit a brick wall. I could not find the cognitive or conceptual structures to comprehend what I knew for many years had happened but I was now seeing with my very eyes where the mass killing took place. And the more I learned, and studied the Holocaust, the more difficult it was to understand it. I recently met a lady in my neighborhood, Muswell Hill, called Gerta Vrbova. She is Slovakian, and her first husband Rudy Vrba was one of a handful of people who escaped Auschwitz and survived. He saw that in 1944 the camp leadership was preparing for a massive influx of Hungarian Jews and he with a friend wanted to escape and warn the world. Over 400,000 Jews were deported to Auschwitz in eight weeks and most were killed in the gas chambers there. And so, we need to hold our leaders to account, that they will stand up in the face of violent language and of course violence itself. And that if they do not use their authority to isolate such acts, they will allow them to undermine the basis of our democracy and our society as well. We remember the murder of Jo Cox MP and the many many threats of violence that Members of Parliament receive. We saw how an MP was called a Nazi outside Parliament, we see how much of a growth there is in Islamophobia in the UK, and we see how much of an increase there is in antisemitism across the country. Acts of antisemitism and the use of antisemitic language are growing on both the right and the left of the political landscape in very different ways. It is worrying. And to be honest only 70 years after the end of World War 2, it is shocking. I remember reading how the late Elie Wiesel felt that in the aftermath of the Holocaust it was difficult to be antisemitic. 70 years on, it is becoming more and more acceptable. I believe that Jewish people here in the UK have a firm and assured place, and contribute much to the fabric of society. I do not feel that there is an existential threat. But the Jewish community certainly needs help in combating antisemitism. It cannot win the battle alone. For nearly 300,000 Jewish people in the UK, we are not prepared to consider the possibility of being torn from home. My great grandfather Emanuel Mayersohn, was a community Rabbi in a town called Rastaat in Germany, near Baden-Baden. He died in 1924 and his three children fled their town in the late 30s never to return. His beloved Synagogue was set on fire on kristalnact just over 80 years ago. But my great auntie, his daughter, would always tell me that on Sundays, my great grandpa would go for walks into the local hills, with local parish priests and ministers. I am not sure I am as good a walker as him – but I certainly learned from his passion to be curious of those not sharing his identity. It didn’t make him less Jewish. It didn’t make him less able to lead his community. It made him a better human being. And so on Holocaust Memorial Day, this year, we desperately need to model to others ways of being that are accepting, tolerant, and able to engage in discussion without aggression. I am not sure the question that interests me most today is whether Brexit will happen or not – even though that is of absolute importance, especially economically. What interests me more is what the Brexit debate has done to our society, taking a discussion of our identity which is decades old, and turning it into a simple binary question that has split the nation. The idea that families have been split over their answer to that question is simply astounding. So maybe when we all reflect on the theme of this year’s Holocaust Memorial Day we can take away a double message. To help and support those who have been torn from their homes. To stand up for them in our communities, to stand up for them on social media, to stand up to them in our dealings with politicians. And also to ensure that we voice our belief in a UK which cares about the homes of all who live in it. David Mason is Rabbi of Muswell Hill Synagogue and an LSE alumnus.